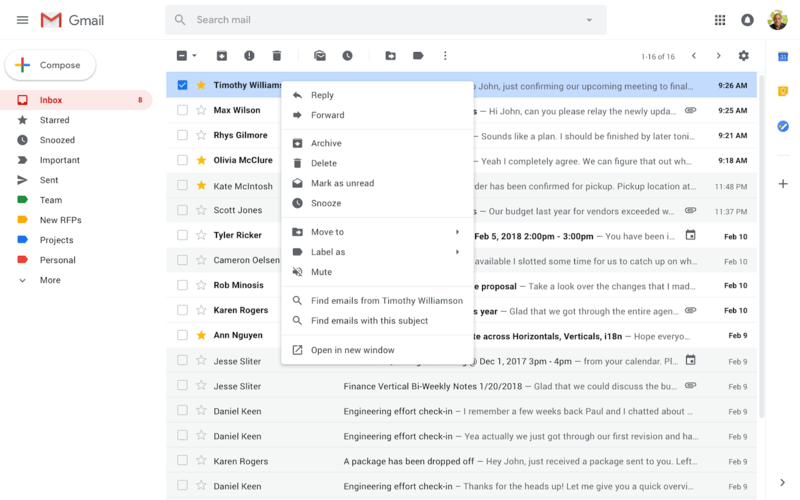 Google announced recently that an update of Gmail's right-click menu functionality will land in February 2019. Gmail's right-click menu is not particularly useful at this point in time as it provides only a handful of options. Right now, the only options provided are delete, archive, mark as unread, and move to tab. Gmail users have to select emails and wait for other options to appear at the top of the screen to activate them. Often used actions such as reply or forward, snooze or label, are found there only. Google announced the change on the G Suite Updates blog. The update will roll out to all G Suite Gmail users and will be enabled by default. No word on whether it will land for free Gmail users as well but it seems likely that this is going to happen. Reply to the right-clicked email. Use search to find emails by the contact. Use search to find emails with the subject. Open emails in new windows. Gmail users can open the context menu using a right-click, the Menu-key on Windows keyboards, or Ctrl-click on Mac OS X devices. The rollout has started already. Google plans to roll out the change to all G Suite users until February 26, 2019. Many features that land for G Suite customers are implemented for free users as well eventually, and usually in a short period. It is about time that Google makes the right-click menu more useful on Gmail. The current options are not thought out well in my opinion. Once the change lands, it is possible to use often used actions such as reply directly from the list of emails; something that has not been possible before using the user interface, if I'm not mistaken. Now You: Do you use the Gmail web interface? Being able to flip ‘conversation mode’ via right-click would be useful. But what would be great to see Google change in Gmail would be to do forwarding correctly. Now, when you forward an email in Outlook, the email is broken out of any conversation and becomes a totally separate thread forever more. But in Gmail, you have to turn off conversation to see the forwarded email. Unfortunately, doing this screws up the display of ALL the rest of your email, as ALL the email are no longer displayed in conversation mode! Sheeze. No, I don’t. I have to use GMail at work, but I use Thunderbird to interface with it rather than the web interface. I avoid the Dirty Diapers known as Google & Microsoft as much as possible. Unfortunately they have me with Captchas…..